Helinox is the brainchild of South Korean company, DAC, a premier manufacturer of aluminum alloy tent poles. 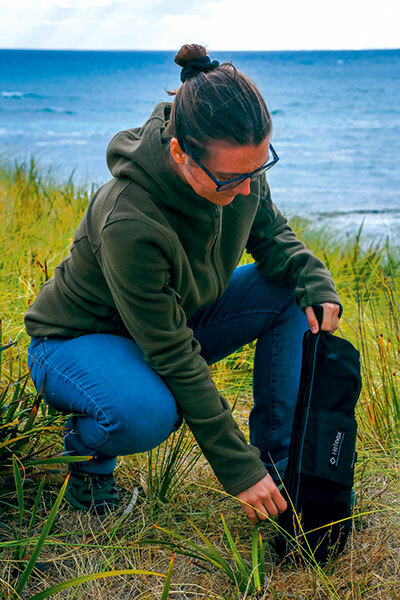 DAC is a stalwart of the outdoor industry, providing ultra lightweight options for camping and backpacking. Recently, they expanded into the outdoor accessory arena, intending to bring the same durability and featherlight packability to chairs, tables, cots, and even umbrellas. During this period of innovation, DAC has maintained its commitment to sustainable practices with its Helinox branch. Anodizing aluminum alloy is traditionally one of the dirtier industrial processes, creating noxious chemicals that are difficult to dispose of safely. DAC and Helinox use a “green anodizing” process that eliminates nitric and phosphoric acids, allowing their TH72M alloy to keep all the corrosion protection without the environmental and human safety issues. My partner, Scott, and I got a chance to test out three of their chair models as we explored the wilds of Tasmania’s West Coast. Each model purports to fulfill a different adventure need, and with Tasmania’s variegated terrain, we had use for each of them. We broke out the set at our first remote campsite, a windswept dune overlooking the savage waves of the Roaring Forties. 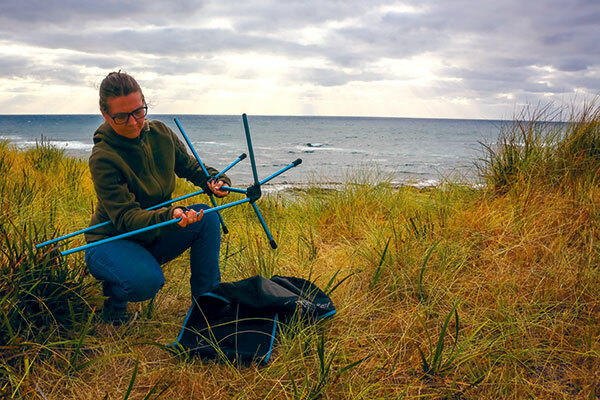 The sun was meandering towards day’s end by the time we’d parked our Toyota Prado, so the quick and intuitive setup allowed by Helinox’s shock-cord linked framework helped speed assembly. All of the chairs live up to the company’s ultra lightweight reputation, weighing from 1485 g with case for the Beach Chair to 1335 g with case for the Camp Chair, in step with most competitors’ offerings. Scott and I have significantly different body types—I refer to him lovingly as “my tank”—but each chair felt suitable for both of us. I didn’t feel like Goldilocks swallowed up in Papa Bear’s lounger, and Scott didn’t tumble or strain the seams. The chairs are rated for 145 kg, and durable stitching plus reinforcing panels promise sustained usage over the long-term. Both the Sunset and Beach models offer a pillow option, where the storage case can be stuffed with a jacket and attached to the top of the chairback. When the chairs are stored in their cases, they fit easily into a car kit with a packed length of 47 cm to 50 cm, a necessity for those of us who tend to overstuff with gear (guilty), or for longer sojourns where every centimeter is spoken for. The Beach version has a ground to seat base distance of only 17 cm, making it challenging to get in and out of, and far more likely to sink into sand or soft ground. 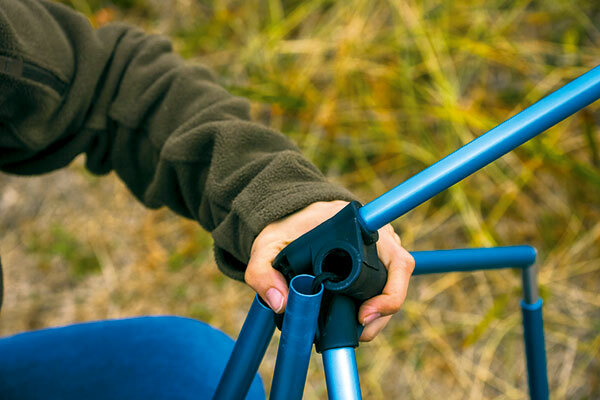 Both the Sunset and Camp models lift 36 cm off the ground, an easier height for general use. The Camp chair’s weight helps for gram counters, but if you’re camping from the car, opt for the more luxurious Sunset option, with higher seat back and greater depth (70 cm versus 60 cm). 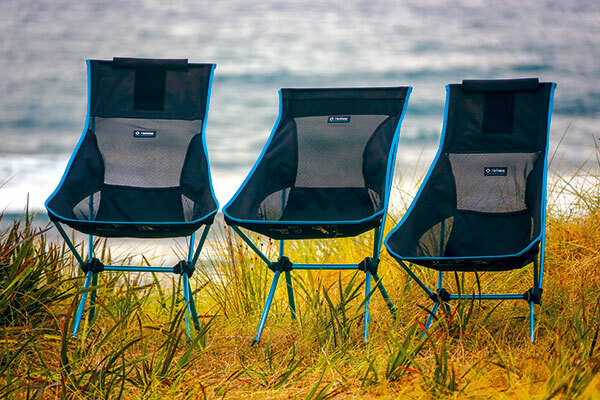 After a hearty meal enjoying the comfort of the Helinoxes and a startling display of cloudplay and falling light, we found it refreshingly simple to get each chair back into its bag, a convenience found lacking in other collapsible chair options. The biggest challenge we faced with these units is the one that undermines all lightweight camp gear: wind. If somebody is not sitting in it, expect any sudden gales to turn it into an expensive kite.